Sightseeing in Vienna | Holiday apartments Vienna! Vienna (German: Wien) is the capital and largest city of Austria, and the Historic City Centre was inscribed on the UNESCO World Heritage List. Vienna has hosted the Habsburg court for several centuries, first as the imperial see of the Holy Roman Empire, then the capital of the Austrian Empire and later of the Austro-Hungarian Empire. This has tremendously influenced the culture that exists there today. Like Munich, its residents are formal, but with small doses of courtliness, polite forms of address and formal dress attire, the residents of Vienna tend to be equally modern and old-fashioned. Waiters address their customers with honorifics; a man who bumps into someone on the street is more than likely to implore his or her pardon with a small bow; tourists are treated as if they were a long-lost member of the royal family returning home. This luxurious treatment is one of the reasons that many people enjoy visiting Vienna. The traditional Vienna is but one of the many façades of this city. Vienna is also a dynamic, young city, famous for its (electronic) music scene with independent labels, cult-status underground record stores, a vibrant club scene, multitudes of street performers and a government that seems overly obsessed with complicated paperwork. However, people are willing to go out of their way or bend the rules a little if they feel they can do someone a favor. The Viennese have a singular fascination with death, hence the popularity of the Zentralfriedhof (Central Cemetery) as a strolling location and of Schrammelmusik – highly sentimental music with lyrics pertaining to death. Old-fashioned Sterbevereine (funeral insurance societies) provide members with the opportunity to save up for a nice funeral throughout the course of their lives. This service does not exist solely to save their children the hassle and expense – it is considered absolutely mandatory to provide for an adequate burial. Vienna even has the Bestattungsmuseum, a museum devoted to coffins and mortuary science. The country’s morbid obsession may be correlated with their higher suicide rate when compared with the rest of Europe. Vienna is also famous for its coffee culture. “Let’s have a coffee” is a very common phrase to hear, because despite incursions by Starbucks and Italian-style espresso bars, the Kaffeehaus is still the traditional place to drink a cup of coffee, read the newspaper, meet friends or fall in love. The ‘old town’, or city center, is the first district. It is encircled by the ‘Ring’ road, which is also the location of many famous old buildings. Districts 2-9 are gathered within the Gürtel (‘belt’) Road; there, you can find the Prater (amusement) park, the hip quarters of the second district (close to Schwedenplatz), the shopping streets of Mariahilferstraße, Hundertwasser House, the Hundertwasser Kunsthaus, and so on. Outside the ‘belt’, there’s the Donauturm Tower, and Schönbrunn Castle, the most visited tourist attraction and deservedly so. Vienna Tourist Board operates information and booking booths at the airport Arrival Hall, 7am-11pm and in town at Vienna 1, Albertinaplatz/Maysedergasse. The Vienna International Airport (IATA: VIE) is actually located in the suburb of “Schwechat”. The airport “Wien-Schwechat” is the home base of the Flagcarrier Austrian . Most European airlines and a significant number of international airlines have direct connections to Vienna. There are three options by public transport to reach the city center of Vienna. As a point of reference, a taxi from the airport to the western part of the city (District 7) is around EUR 40 (including extras and a tip). A taxi from the Rennweg S-Bahn station (where the S-Bahn to the airport departs) to the airport costs around 25 EUR. Taxi prices are negotiable before you climb in! The City Airport Train (CAT) takes you directly from the airport to the city centre in 16 minutes. The return ticket costs €16 or €9 one way. The CAT is used mainly by business travellers (or those lured by advertising into believing that there are no alternatives) and is only useful if you are in a great hurry. The CAT is owned by the airport (not by the Austrian Federal Railways) and is heavily advertised in Austrian Airlines cabin announcements upon landing, in terminal transfer buses and in the airport building itself. When you leave Vienna by plane, and if you use Star Alliance Flights, Air Berlin or Fly Niki, your baggage can be checked in at the city center, which leaves you baggage-free and more time in Vienna; the price is still high for saving 11 minutes. Although no longer advertised by the airport management (which prefers to deny the S-Bahn’s existence and to promote its overpriced CAT instead), the normal S-Bahn (Schnellbahn) (fast regional train) S7 (or S2) is also direct, merely 10 minutes slower than the CAT and costs just a third: €6 return (or €3 one way) if bought in advance (and only €3 if you have the Wien card), stopping at Wien Mitte, Wien Nord and Wien Handelskai among others. If you already have a U-Bahn day pass, you only need to add a “Aussenzonen” (outer zone) ticket for 2 Euro (1.50 Euro if bought in advance). Do punch the ticket before getting on the S-Bahn, as punching machines are not installed inside the train. Note that you will need to buy a 2-zone ticket (or two 1-zone tickets) to total €3 each way to and from the airport. To reach the S-Bahn, follow the CAT signs for all but the final 50 meters: the S-Bahn and the CAT leave from the same underground railway station, but from different platforms. For more information check out http://www.info.wien.at/article.asp?IDArticle=10263. Once you have your 2-zone ticket, you can travel from the airport to any Viennese destination (free transfer for one hour; you don’t need to buy further tickets for Viennese bus, subway or tram lines). There are two direct lines going every 30 minutes from the airport to Vienna. One is going to “Morzinplatz” next to “Schwedenplatz” very close to the city center, the other one to the main railway stations. At Schwedenplatz you have two subway lines (U4 and U1) as well as busses and trams. 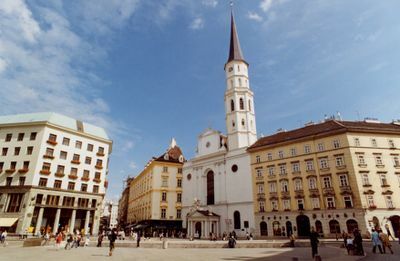 In about 5 minutes walk you are at St. Stephan´s Cathedral, the very center of Vienna. The trip costs €6 and takes about 20 minutes. The bus trip to Südbahnhof (Southern Rail Station) or Westbahnhof (Western Rail Station) costs €6 and takes about half an hour. Usually a bus leaves the airport or the stations every 30 minutes. Costs : Single ride – 6 Euro, Round trip – 11 Euro. You buy the ticket from the bus driver. Vienna is a railroad hub, easily accessible from other major European cities. Overnight trains arrive from places like Paris, Bucharest, Berlin and Venice. The train from Prague takes less than 5 hours. There is a special discounted round-trip ticket you can buy if traveling from Budapest called a “kirandulójegy” or excursion ticket in English. For €29 you can buy a round trip ticket between Budapest and Vienna good for 4 days that will also cover all your local transportation within Zone 100. Since a 3-day transport pass usually costs €12 you’re basically getting a round trip ticket for €17! This is an excellent deal especially if you’re planning on going back to Budapest. NOTE: There are 2 major train station, Westbahnhof (West Station) and Südbahnhof (South Station). Südbahnhof does not connect directly to the metro system. The nearest metro station is outside of the station about 400m away. Look for Südtiroler Platz. Many trains from Germany arrive at the Westbahnhof. Trains to Bratislava (only an hour away) usually depart from the Südbahnhof, but occasionally from the Westbahnhof. Most Austrian highways (“Autobahn”) terminate/originate in Vienna. Unlike Germany, there is a strictly enforced speed limit of 130 km/h on highways. Within towns it is 50 km/h and on major roads, it is 100 km/h. Also a Highway Toll Sticker (Vignette) is a must! Not having one can be really expensive. Usually they can be purchased at petrol (gas) stations. Drivers in Austria are also required by law to carry certain safety equipment. This includes a reflective vest, first aid kit and traffic warning triangle. It is required to keep your headlights on at all times while driving in Austria. Parking is restricted to 90 minutes and subject to a fee of €0,80 per hour anywhere in the inner districts unless you are a resident. Payment is made by marking the time of arrival on a ticket (“Parkschein”) which can be bought at tobacco shops. If you wish to leave your car in Vienna for the period of your stay, you must either book a hotel that offers parking or leave it at a commercial car park (Parkhaus, Parkgarage). These can be very expensive. A cheaper alternative is park and ride, normally available at U Bahn stations in the city periphery, for example at U3 Erdberg station (€ 2,70 per day). Avoid the A23 Südosttangente at rush hour. Traffic jams are almost guaranteed there. Eurolines is a relatively cheap way to reach Vienna from major European cities. Buses usually stop at the subway station Erdberg (line U3). Riverboats on the Danube include connections with Budapest and Bratislava, but it’s of little value – unless you just love going on (slow and relatively expensive) riverboats. 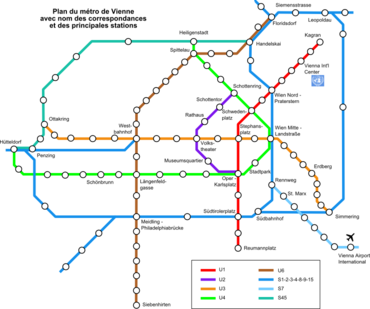 Vienna has an excellent public transport system, which includes commuter rail, underground, trams (trolleys), and buses. Within Vienna itself, you can get a single trip ticket for any of these for €1.50, or a 24-hour ticket for €5, a three days pass is 12 euros. You can buy tickets at machines in or near stations, at major stops, and, for an additional charge, from a bus driver or on a commuter train. Stamp your ticket at the start of its first use (there are stamping machines on the buses and trams, and near the entrances to the stations). You can use one ticket to go in one direction on as many lines as you like, for as long as it takes you to get there. You have to buy another ticket if you stop and get out, or if you want to go back in the direction from which you came. Payment is by the honour system; normally you don’t have to show the ticket or stamp it again when you board, but occasionally (very rarely) inspectors check for valid tickets. If you don’t have one, it’s an instant €60 fine (plus the fare you were supposed to have paid). Also, the 8-Tage-Karte (8 Day Ticket) for €24 gives 8 non-consecutive days of unlimited travel on U-Bahn and trams until 1:00AM (just after midnight). There are 8 blank lines on the Karte (ticket). Fold the ticket to the desired blank line starting with blank line numbered 1. The ticket can be shared by people traveling together. Punch one line per person per day. Trams have a punch machine inside. The U-Bahn has a punch machine at the entrance. You can travel to the Flughafen (airport) on the S-Bahn using this ticket with a €1.50 (1.50 advance or €2 on the train) Aussenzonen (outer zone) ticket. www.wienerlinien.at : The official Vienna public transport site, with information on tickets, timetables and maps. Mostly in German ; use Babelfish or Google to translate it. www.wienerlinien.at/WienerStadtWerke : Detailed metro map (PDF format). Rail trips to the outskirts of Vienna may require additional fare. For example, a trip to or from the airport on the S7 line is a two-zone ride, requiring either a €3 advance purchase, or a single zone (€1.50) ticket supplement to one of the timed-use Vienna tickets. Because Vienna is one of those cities that never sleeps, a dense network of night buses is available for those who have a rather nocturnal approach to tourism. Since 2002, regular tickets may be used on these buses. Most terminate at “Kärntner Ring, Oper”, which allows for easy interchange. Intervals are usually no less than 30 minutes, with some busier lines going every ten minutes. Walking can also be very pleasant. The inner Ring is quite compact, with lots of pleasant cobblestoned and paved streets, and can be crossed in about 20 minutes. Cycling is another popular option for travelling within Vienna, as there are many bicycle paths and lanes along major streets, in parks, and by the rivers. Vienna’s compact size makes cycling attractive. On a bicycle you can reach most places of interest within half an hour. If your destination is located in the outer suburbs, you may consider taking your bike on the U-Bahn or S-Bahn. A company called PedalPower offers guided bicycle tours, or bicycle rental deliveries to your hotel (or you can pick them up at the Prater for a discount). CityBike: The city also offers free or low-cost short-term “CityBike” rentals at various fixed locations near the central city.You need a Creditcard to rent a bike or get a Touristcard for €2 a day. You can sign up to the CityBike service at any CityBike station or more conveniently online. The first hour is free, the second one costs €1, registration costs 1€1 but counts as credit for the first payment you have to make. If you interrupt your trip for longer than 15 minutes the following rental will be counted as a new first hour. More detailed information can be found on here (German and English). Avoid driving a car within the central ring if possible. While cars are allowed on many of the streets there, the streets are narrow and mostly one-way, and can be confusing for a visitor, and parking is extremely limited (and restricted during the day). Due to the comprehensiveness of the transit system, you most likely will not need a car within Vienna, except for excursions elsewhere. Furthermore, it might be a good idea to leave your car at home during rush hours. Vienna’s streets can become a little clogged in the mornings and early evenings and the drivers are not really known for being especially polite and friendly. Pedestrians have the right of way in crossing all roads at a crosswalk where there is no pedestrian signal present. If there is such a pedestrian crossing on an otherwise straight section of the road, there will be a warning sign – you are required to yield to any pedestrian on this crossing! Austrians accustomed to experienced local drivers will step out with little thought and force you to stop, so slow down here and be careful! When driving in a neighborhood this “right of way to pedestrians” is an understood rule at every intersection, although pedestrians will be more careful before they step out. Again, be on the lookout for this – if you see a pedestrian waiting to cross, you should stop at the intersection for him/her. * Belvedere – Austrian Gallery was commissioned from architect Johann Lukas von Hildebrandt by military leader Prince Eugene of Savoy (1663-1736), known as one of the best military strategists of his time. It was intended as a summer residence, and was located outside the city walls. Art historians know the Belvedere as on of the finest Baroque structures in the world. Its two palace segments, the Upper and Lower Belvedere, later became the permanent home of the Austrian Gallery. The Oberes Belvedere (Upper) contains recent Austrian and international art from the past two centuries. Viennese art from the early twentieth century is well-represented in the permanent collection “Vienna around 1900 and the Art of the Classical Modern.” Gustav Klimt, master of a particularly Viennese form of Art Nouveau called Jugendstil, or sometimes Viennese Secession, has several world-renowned paintings in the Belvedere, of which “Judith” and “The Kiss” are his best-known. Covered in gilt, broken up into hundreds of small color panels (almost Impressionistic, in a way), the tall, thin figures in Klimt’s paintings are uniquely his own. Egon Schiele, another Viennese artist working at the same time as Klimt, would utilize such singularly thin and ultimately recognizable figures in his own work. The days of strict realism were over, and fantasy was afoot. Schiele is well-represented in the Belvedere as well. Take tram D, stop Belveder. The New Palace (Neue Hofburg). The New Palace is the newest and largest section of the Imperial Palace. It contains the Ethnological Museum and three branches of the Museum of Fine Arts. The Ephesus Museum contains classical art from Asia Minor, the Collection of Historical Musical Instruments is self-explanatory, but the jewel of the New Palace is the Collection of Arms. This collection, second largest in the world, houses an immense and exhaustive representation of weaponry from past centuries. Schatzkammer (Imperial Treasury). Located in the Neue Hofburg, the Schatzkammer (also known as the Secular and Ecclesiastical Treasures) is the best part of the Hofburg, and an absolute must on any tour of Vienna. Second only to a tour of the Kunsthistorisches Museum itself, of which the Schatzkammer is officially a part, there are 20 rooms of priceless treasures that give a fairly accurate feel for Habsburg court life over the centuries. Kunsthistorisches Museum (Museum of Fine Arts), €10. Picture Gallery daily except Monday 10 am-6 pm, Thursday 10 am- 9 pm, U2: Babenbergerstrasse, U3: Volkstheater, tram D, J, 1, 2, bus 57A: Burgring Maria-Theresien-Platz (entrance), phone 525 24 0. One of the world’s great art museums, in a palace that’s a work of art itself. Like the Louvre, serious art fans may wish to devote more than a day to its treasures. The mother of all Austrian museums – there is no other word to describe the Kunsthistorisches other than mind boggling. It’s at the very least a full day’s worth of sightseeing, if you intend to go through it thoroughly and attempt ponder the importance of each major work. The better approach here is to break up sections of the museum and visit them over a series of days, or if that’s not an option, pick one section and concentrate on it alone. The Picture Gallery is kept open until 9 pm on Thursdays. Beginning with another section of the museum, it’s possible to have a lunch or light dinner in the café and then continue through the Picture Gallery until closing time. The Museum has an excellent collection of ancient Egyptian, Greek, and Roman art. The coin & medals collection is also exhaustive in its scope. The Museum cafe is a bit pricey, but good, and in a beautiful setting. The Imperial Furniture Collection – Vienna Furniture Museum Andreasgasse 7, 1070 Wien, phone: +43-1-524 33 57-0. Opening Hours: Tue – Sun 10 am – 6 pm. The museum is wheelchair-accessible. The museum with the largest furniture collection worldwide is considered as an insider’s tip and is located just off bustling Mariahilfer Strasse. So you can go shopping and to the museum. Take the orange underground line U3 (alight at Zieglergasse, take the Andreasgasse exit). The items on display include used furniture by all the Austrian emperors since Charles VI (the father of Maria Theresa), furniture by the Thonet Brothers to Jugendstil, the Viennese Modernist movement and contemporary Austrian architects and designers such as E.A. Plischke, Margarete Schütte-Lihotzky, Luigi Blau and Franz West. Besides the permanent furniture collection the museum also hosts two to three temporary special exhibitions on furniture design and photography each year. Information on the current special exhibitions can be found at www.hofmobiliendepot.at (exhibitions). You can purchase a single ticket or a combined ticket “Sisi Ticket” which in addition to the museum allows you to visit Schönbrunn Palace, the Imperial Apartments, Sisi Museum and the Imperial Silver Collection in the Hofburg. Take U3, stop Zieglergasse. MAK – Austrian Museum of Applied Arts / Contemporary Art Stubenring 5, 1st District, phone: +43-1-711 36-0, open: Tuesday 10 am-to midnight (MAK – NITE(c)), Wednesday-Sunday 10 am-6 pm. closed on Monday. Free admission on Saturday. MAK Design Shop. Permanent Collection. Study Collection. Exhibitions of contemporary art, design, architecture. How to go there? Subway U3, Tram 1, 2, bus 1A, 74A to Stubentor, and U4 to Landstrasser Hauptstrasse, City Airport Train from the airport to Bahnhof Wien Mitte. Also part of the MAK is the Depot of Contemporary Art (Gefechtsturm Arenbergpark) 3rd district Dannebergplatz/Barmherzigengasse, how to go there: bus 74A to Hintzerstrasse or U3 to Rochusgasse opening times in 2006: Mai 7-November 26 every Sunday 11 am-4 pm. If you like modern art and are short of time, the Leopold and MUMAK in the Museums Quartier have far larger and better collections than MAK. A lovely addition to a visit to MAK is popping over the road for a coffee at the 100-year old Cafe Pruekel. Take U3 or trams 1/2, stop Stubentor. KunstHausWien (Vienna House of the Arts) Untere Weißgerberstrasse 13, open daily from 10 am to 7 pm (Every Monday the regular admission fee in all exhibitions is reduced 50%), Tel: +43-1-712 04 91. To get there, take the street tram O from Landstrasse and get down at Radetzkyplatz. Even an avowed hater of modern art can appreciate the KunstHausWien, Hundertwasser’s (born Friedrich Stowasser in 1928) major contribution to the Viennese art world. In a time when artists often try to shock the public or merely impress other members of the rarefied gallery subculture, Hundertwasser’s manifesto rings out as an utterly reasonable plea: The architecture of KunstHausWien would be a bastion against the dictatorship of the straight line, the ruler and T-square, a bridgehead against the grid system and the chaos of the absurd. Starting with the façade of the building, adapted from its prior life as a furniture factory, there is a Gaudi-in-Barcelona feel to the place. Windows peek out like eyes from curvy, rounded plaster and colorful paint. It’s a Disneyland for grownups! Do not miss the Hundertwasserhaus and the shopping village situated about 300m from KunstHausWien. Take tram O/N, stop Radetzkyplatz. Hundertwasserhaus This interesting apartment/office complex is located 5-10 minutes east of the Wien Mitte U-Bahn stop. You can also take tram N, stop Hetzgasse. Museumsquartier (The Museum District) (MQ) is the new cultural district of Vienna since 2001. Though a lot of museums and cultural institutions are situated there, it is not only a place for art. It is also an urban living space and people go there to spend some time, sitting in one of the cafés or perhaps playing boccia. The Leopold Museum and the MUMOK are situated there. If you are interested in visiting a couple of these museums, combination tickets available at the MQ entrance will be cheaper than buying them individually at museum entrances. Note that MUMOK and Leopold has a strict policy of not allowing big bags inside the museum. Even your cameras (unless they can be tucked inside a small carry bag) will have to be deposited outside. MUMOK has a self service locker, which you might want to use when visiting Leopold since Leopold charge €1 per person for the “cloak room” service. Within MQ you can use the free wireless LAN provided by Quintessenz. Technical Museum This newly renovated museum near the Schoenbrunn Palace exhibits machines, transportations, electronic equipment and the like from their first design up to their current form. It also depicts the development of Vienna as a city, on all its technical aspects (recycling, power, sewage). The museum is huge (22,000 m2) and requires at least two hours to go through. Take trams 10, 52, 58, stop Penzinger Strasse. Natural History Museum This museum was erected as a mirror to its twin museum, The Museum of Fine Arts. It exhibits various minerals, fossils, stuffed animals and skeleton reconstructions (among others, Dinasaurs’ skeletons). It also includes an anthropological section, where you can see the beautiful Venus of Willendorf (which is 25,000 years old!). Haus der Musik (The Music House) This relatively new museum is a special museum, in that it attributes great value to interactive learning experience. It covers the history of the Vienne Philharmonic Orchestra, the history of Vienna as a centre of music making (Mozart, Haydn, Beethoven, Mahler, Schubert and others are documented). In addition there are the more experimental sections of futuristic composition (The Brain Opera) and sound experiences. Highly recommended! Look for the happy hour. Take U1, U2, U4, trams 1,2, 62,65, J and D, stop Karlsplatz/Opernring. Albertina Once a palace, it is now the most popular exhibition space in Vienna, mainly for traditional modern art. The building itself is an experience as well. It is also home to a valuable drawing collection including many works of the German Renaissance painter, Duehrer. Museum am Schottenstift (Museum at the Scottish Monestary) ; only in German) A nice small picture gallery mainly of Baroque Austrian painting. Take U2, trams 1,2,37-38,40-44,D, stop Schottentor. Liechtenstein Museum A private collection of the Prince of Liechtenstein, it is exhibited in his once Viennese Residence. The richly decorated picture gallery mainly exhibits Baroque paintings, with a nice portion of Rubens. You can get there either with tram line D, stop Seegasse or about 10 minutes by foot from U2 subway stop Schottentor. Gemaeldegalerie (Gallery of the Academy of Fine Arts) A gallery owned by the Academy of Fine Arts, to which Hitler applied before he decided to change to politics. It offers some painting of Rubens and Bosch. Most interesting are the Renaissance and medievil exponents. Freud Museum This small museum is situated in Freud’s historic flat, where you can still see his original treatment sofa. The museum also documents his theoretical writings. Near the Schottentor subway stop (U2) – 10 minutes walk, or take tram D, stop Schlickgasse. Vienna Museum A museum documenting Vienna’s history. It is split into several branches with its main branch at Karlsplatz. Otto Wagner used to be the most prominent Viennese architect at the turn of the 20th Century. Two museums are dedicated to his work. At the Wagner Villa you can see his private lodging in a very eccentric design. The villa is also beautifully located in the woods. In the rooms some paintings of Fuchs are exhibited, a painter who bought the house from the Wagner family. His painting were surprisingly influenced by the style of the villa… (highly recommended!). You can get there with tram number 49 (last stop). Another museum is the Otto Wagner Museum ] at the post office of his original design. At this museum you can see the more serious aspect of his artistic enterprise, that of public life. At the museum you can see some of the original furniture as well as his plans. Near the Schwedenplatz U1 stop (trams 1,2, 21, N). Museum of Military History A huge museum near the southern railway station featuring weapons and military maps from different periods. You can also see the carriage in which the last Austrian prince was shot in Sarajevo, the incident which triggered the First World War and the downfall of the Austro-Hungarian Empire. Near the Southern Railway (Suedbahnhof), trams 18, D, O.
Jewish Museum A museum documenting Vienna’s rich Jewish life with Zweig, Freud, Herzl, Mahler and Schoenberg among the most renowned of them. Attached to the museum are a medieval underground synagogue at the Judenplatz and the Stadttempel, the only historical synagogue in Vienna to have survived WWII. If you are looking for exhibitions of modern art apart from the MUMOK and MAK there are several other places you could visit: MOYA , The Artists’ House , the Secession (see under attractions), The House of the Arts (see Hundertwasser above), Atelier Augarten (a branch of the Belveder), Kunsthalle (Exhibition Hall) – there are two of them, both branches of the Museum District (MQ) and the Generali Foundation . Near Vienna there is the Essl Collection in Klosterneuburg (see below). Mozart House The Viennese residence of its most famous composer. A branch of the Vienna Museum (see above). Karlskirche, baroque church at the Karlsplatz, 1st District. Largest Baroque cathedral north of the Alps, designed by the famous architect Bernhard Fischer von Erlach. Frescos done by Michael Rottmayr and paintings from the Italian Baroque painters Sebastiano Ricci and Giuseppe Antonio Pellegrini, and the Austrian painter Daniel Gran. Augustinian Friars’ Church (Augustinerkirche), Josefsplatz 1. Facing the sculpture in the center of the square, the entrance is small and easy to miss – it’s on the left hand wall of the square. Yet another example of the gruesome divide-and-conquer burial strategy of the Habsburg dynasty. It’s said that other dynasties waged countless wars to acquire new lands, but “you, happy Austria, marry.” Even in death the Habsburgs placated three different churches with the honor of caring for their remains. The best known, the Kapuzinergruft, contain their actual bodies. St Stephens holds their innards (intestines and other parts taken out during the preservation process). But the Augustinerkirche holds, in the Herzgruft (Heart Crypt), all the Habsburgs’ hearts. Tours of the Herzgruft are available Monday through Friday at 11am and 3pm. It was renovated 1996-99 and just reopened. The tradition began in 1627 with Emperor Ferdinand IV, who wanted to “lay his heart at the feet of the Mother of God” – literally. His heart, and those of his descendants, are preserved in silver jars which are carefully cared for by the Augustinian friars who run the church. When the renovation was underway it was found that the preservative in some of the caskets had evaporated over the years, leaving nothing but a dried-out, mummified heart. Austrian National Library – Österreichische Nationalbibliothek Josefsplatz 1, 01/53410-348. Card catalogs may be an anachronism in today’s digitized world, but the Austrian National Library had the first one in existence, invented by the Habsburg court librarian. Unlike the printed library catalogs of the past, bound into book form, the card catalog could be rapidly updated and the library kept up-to-date. This well-ordered reader’s paradise has a collection that outshines many museums, thanks to its long association with the Habsburg imperial family. It gained an impressive collection when Emperor Josef II dissolved all the empire’s monasteries – 300 manuscripts, 3000 printed books and 5000 diplomata. Today, the main collections consist of the Department of Broadsheets, Posters and Exlibris (including a giant collection of Austrian and international film posters), the Department of Manuscripts, Autographs and Closed Collections, the International Esperanto Museum and Department of Artificial Languages, the Department of Maps and Globe Museum, the Austrian Literary Archives, the Department of Papyri and Papyrus Museum, the Department of Incunabula, Old and Rare Books and the Austrian Folk Song Institute, among other sections and rotating exhibits. The library’s collection is approximately six million items strong and is the largest in Austria. It is a pioneer in digitalizing and placing its collection online. The oldest book in the collection is a fifteenth century Holy Gospels manuscript with scenes representing the four Evangelists (Matthew, Mark, Luke and John) containing the coats of arms of the House of Austria, Styria, Tirol and Carinthia, then ruled by Albrecht III, the book’s owner. Emperor Frederick III (1415-1493) made an effort to gather all the various Habsburg manuscript collections into one place. After the 1848 revolutions, during which the library was placed immediately in the line of fire (some faithful librarians remained behind and managed to save the books as the imperial palace caught fire), Emperor Franz Josef I agreed to open the library to the public and even keep the library open into the evening hours. Ernst Ritter von Birk, head of the Court Library and one of the library’s saviors during the uprising, may have been forced to accept these liberal business hours to appease the Emperor, but he still had the right to restrict the public’s access to the holdings. Renamed the National Library in 1920 (much to the objection of some library committee members, who argued that an Austrian “nation,” as such, did not exist), the Library has since served the public in a much less strict fashion than in the good old days under von Birk. This entry was posted in About Vienna and tagged Hofburg, IAEO Vienna, Schoenbrunn castle, Sightseeing in Vienna, Unesco World hertitage list, UNO Vienna, Vienna opera. Bookmark the permalink.